Hint: This article contains help in answering the Great Arsenal Competition in which you can win a copy of Woolwich Arsenal the club that changed football – or one of our other books. Some players are great. Some – a few – are beyond greatness. We may think in the current era of Bergkamp and Henry. In the 1930s they would think of Alex James. Even today in any list of great players of Arsenal we would expect to see him in the top 5. Throughout the glory years of the 1930s James was considered the linchpin of the team playing as an unorthodox inside-forward acting as a link between the defence and attack rather than as an out-and-out forward. However, in any list of great Arsenal captains for some reason he doesn’t get a mention. Back in November 2008 the Arsenal website ran an article on Arsenal’s greatest captains. All the great names that skippered title and cup-winning teams are there. Except for “wee Alex”. Yet Alex James should be on this list as he captained Arsenal to two league titles and was captain for the majority of another title winning season, as well as being captain of one FA Cup winning team. The three titles just happened to be the three consecutive titles between 1932‑33 and 1934‑35. So, what has happened in the annals of history for Alex James to be stripped of the recognition as Arsenal’s second greatest captain after Tony Adams? Captained the club to its first major trophy – the 1930 FA Cup. Signed by Herbert Chapman in 1926 and kicked off his Arsenal career with 172 consecutive first-team matches, a Club record that still stands today. A reliable defender, Parker led the side to the 1927 FA Cup Final but suffered defeat against Cardiff. 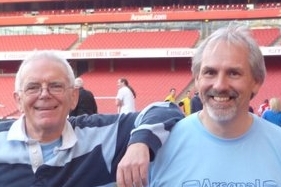 Made amends three years later as Arsenal beat Huddersfield at Wembley. Parker skippered the side to its first League title in 1931 before leaving the Club in 1933. Hapgood succeeded Parker as captain and was a key figure in Arsenal’s all-conquering 1930s side under the stewardship of Herbert Chapman and then George Allison. Hapgood skippered the club to four League titles between 1933 and 1938 and lifted the FA Cup in 1936. He was just as influential for his country, winning 21 of his 30 caps as England captain. He wore the armband for the first time on November 14, 1934, in the infamous ‘Battle of Highbury’ against Italy. Indeed one page on the web site actually takes Hapgood’s title count to five! What seems to have happened is that everyone has assumed that Eddie Hapgood succeeded Tom Parker as captain of Arsenal when Parker left in March 1933. 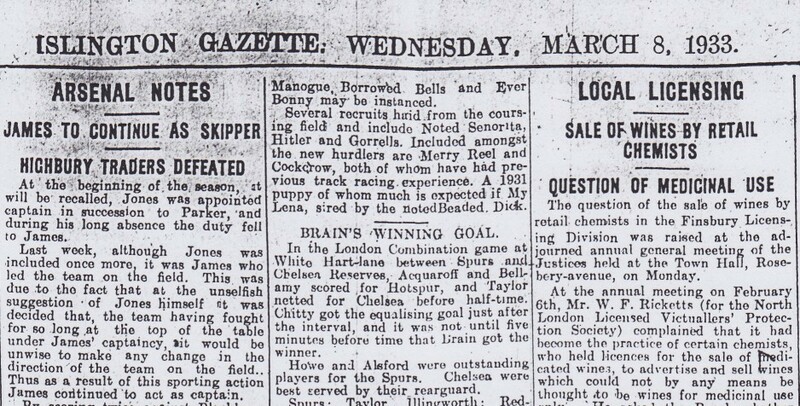 As the article rightly states Hapgood captained England against Italy in 1934 and seems to assume that surely he must have been Arsenal’s captain at the same time. Of course today we know that one does not follow the other. If we look at today’s Arsenal team we have Aaron Ramsey as captain of Wales, Tomas Rosicky captaining the Czech Republic, Andrey Arshavin running the show for Russia and Ju Young Park taking charge of South Korea. All captain of their international sides but none of them even make it up to being Arsenal’s vice-captain let alone team captain. Arsenal’s Official Illustrated History goes further and tells the story of Hapgood finding out that James would be captain in the 1936 FA Cup Final from a newspaper. This gives the impression that Hapgood was captain but was stripped of this for some strange reason for this one game – a strange reason that is not explained in the Official guide. So, time now for the Arsenal History Society to come to the rescue and put the true facts together. And in so doing, to give Alex James the credit he deserves. 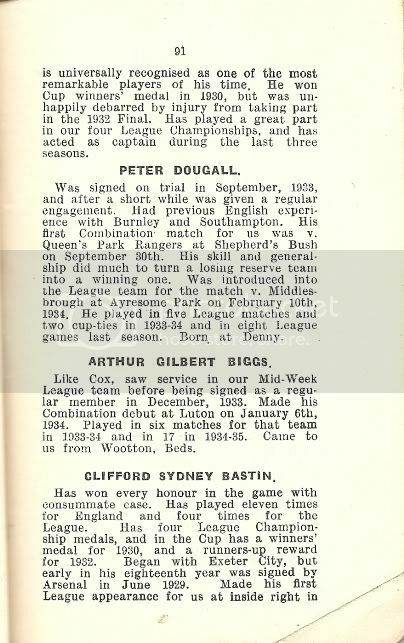 At the start of the 1932-33 season Tom Parker was 34 and coming to the end of his playing days. Herbert Chapman decided that two young bucks – Leslie Compton and George Male – were both capable of replacing Parker who only played five more games for Arsenal. But during the summer of 1932 Chapman decided to replace Parker as captain with Charlie Jones. However, Jones picked up an injury in October and so the team was skippered by vice-captain Alex James in his absence. When Jones regained fitness in March 1933 he handed the captain’s armband (well, he would have if they had them back then) to Alex James as he had done so well in keeping the team at the top of the table. By a strange quirk of fate for the following season, James only played 22 league games and Jones (now vice-captain) played 29. However, James was captain for the majority of the league games – and he also scored one of the two goals that earned a point at Stamford Bridge to clinch the title. We have three Arsenal programmes that show the true nature of the situation. Unfortunately the quality of the reproduction is poor, and won’t show up too well on all computers – so we’ll carry on with the story and gather the illustrations together at the end. The first from 1934 shows James missing from the team. However, Charlie Jones is shown as captain, not Eddie Hapgood. 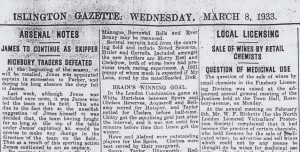 This obviously means that Hapgood did not take over as captain in the summer of 1933. James continued as captain until his retirement in the summer of 1937. 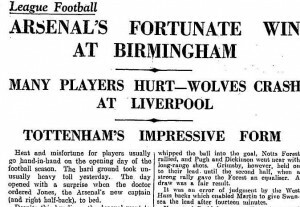 The story behind the 1936 FA Cup Final was that James had been plagued with injuries in the run up to the game and it was touch and go whether he would play. Hapgood had been promoted to vice-captain following Jones’ departure in 1934 and with James not expected to play he would be captain. However, James passed a late fitness test and took the field as captain. 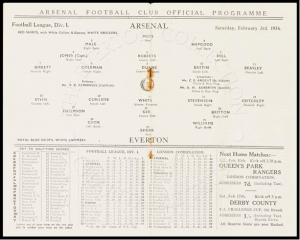 The second programme from 1934-35 shows Hapgood and James in the team with James as captain. The third is from 1936-7. Contrary to what has previously been published, Alex James is Arsenal’s second greatest captain; leading his team to three league titles, one FA Cup and one Charity Shield. Sadly, this means that Eddie Hapgood’s record as Arsenal captain is overstated, winning a single league title in 1937-38. But then, if you were doing our quiz you probably knew that anyway. Now to the programmes. We’re really sorry if you find these hard to read, and we will try and work out a way of enhancing the quality. 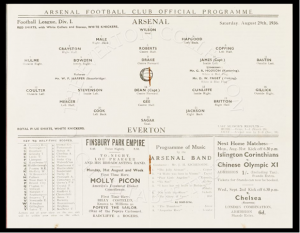 The second programme from 1934-35 shows Hapgood and James in the team with James as captain. 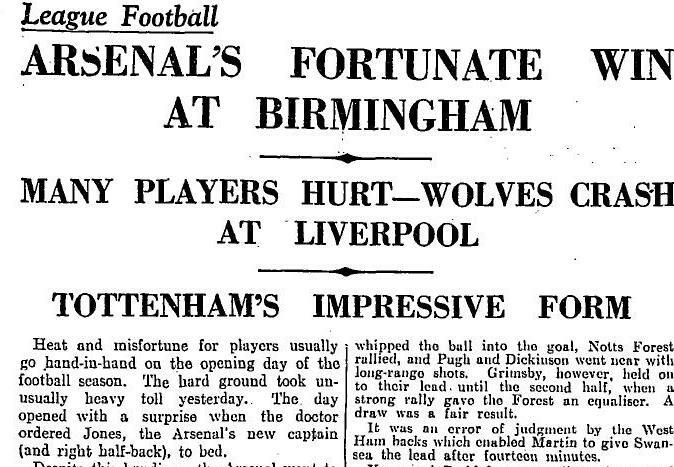 Interesting stuff, but I understood the reason behind Hapgood not being captain for the 1936 Final was due to Hapgdood’s mother’s ill health, meaning Hapgood hadn’t trained with the team in the week of the final and he didn’t make a decision on whether or not he could play in the final until the last minute. I believe I read that in Brian Glanville’s ‘The Real Arsenal.’ That would suggest Hapgood expected to be captain in normal circumstances? Little Dutch, Hapgood would only have been captain in the final if James hadn’t played. James had been dogged by injuries in the run up to the final and on the day before the final Arsenal announced that the team would be selected from 11 of 12 players. The only issue was with the forward line where 5 players would be selected from 6 named. Pat Beasley was the unlucky player who missed out due to James’ late selection. 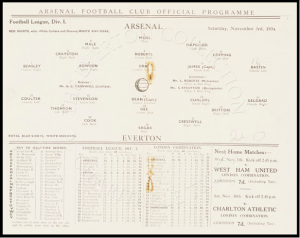 If you click on the small pictures of the pictures of the programmes they take you to full size pictures on the excellent Everton Collection website. One day I’d like to see an Arsenal version. Don’t forget today is the 100th Anniversary of the birth of Ted Drake!